These chocolate stout brownies are made with stout for a rich, decadent brownie with deep flavor and luxurious texture. A perfectly grown-up version of a childhood treat! I’ve been wanting to make chocolate stout brownies brownies for some time, ever since I had a great success with Champagne Brownie Cake. This week’s #SundaySupper theme is Libational Recipes, so I just couldn’t pass up the opportunity to experiment. Using the Champagne Brownie Cake as a starting point, I modified the recipe slightly by removing the baking powder and adding a tablespoon of butter to reduce the cakiness. The result is indeed denser and less cakey, while still retaining an overall lightness that is quite pleasing. I thought long and hard about what type of beer to use. In the end, I chose a double chocolate stout to reinforce the chocolate flavor and provide its own notes of caramel and toffee. The resulting taste is rich, complex, and not too sweet. It’s truly a grownup brownie! If you’ve never heard of a chocolate stout, here’s an example. You can serve these chocolate stout brownies with milk… or double down and serve them with chocolate stout. Don’t forget to check out all of the other #SundaySupper recipes located below this recipe! You'll love this rich, deeply flavored, and not-too-sweet brownie! It's flavored with real chocolate stout for a grown-up taste that's sure to satisfy. In a small bowl, stir together the flour, cocoa, and salt until uniform. In a large bowl, beat the sugar and eggs together. Slowly pour in the melted butter, whisking continuously. Add the vanilla extract. Slowly pour in the beer, whisking continuously until just combined. Stir in the dry mixture until just combined. Scrape the batter into the prepared pan and smooth it out. Bake in the oven for about 25 minutes, or until a toothpick inserted in the middle comes out with moist crumbs on it, but no wet batter. Let cool in the pan for 10 minutes, then lift out the paper or foil liner, place on a rack, and let cool completely. Store airtight. You may use natural or Dutch process cocoa in this recipe. I prefer natural cocoa for its more robust flavor, but Dutch process cocoa will work just as well. 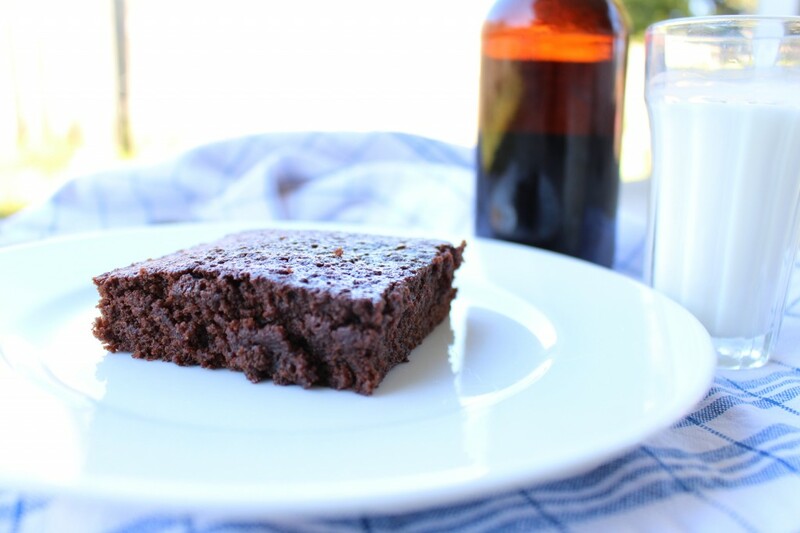 These are THE brownies to make for anyone who loves stout beer. Awesome. Oh many these looks so moist. 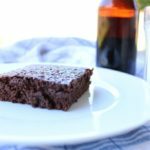 I’m so intrigued by the addition of beer in these brownies! They are super moist. I forgot to pack them up airtight after they cooled, and the next day they were still moist! WOW! This my kind of Brownie! This looks so very good, great recipe!! I love stoudt and I’m up for a glass with these brownies! I’ve seen chocolate and stout cakes, and having been wanting to try them. But these brownies are far more likely to get made! Thanks for sharing! I’ve definitely seen chocolate stout cake but never brownies! Clever clever. Can’t wait to try these. Stout is what it’s all about! Classic combination you have here, Katie! Thank you for sharing! Yayy Katie, I always love your awesome brownie-based recipes! The stout here is nothing to turn my nose up at–sounds like a FAB combo!! I love baking (and cooking) with stout, but I’ve never tried it in brownies. MUST correct that, soon! Thanks for the great recipe! you definitely cant go wrong with a good stout… AND chocolate!